Today I found out the rights to the game Tetris were originally owned by the Soviet Union. The game was created by Alexey Leonidovich Pajitnov, with the assistance of Dmitry Pavlovsky and Vadim Gerasimov who ported it to an IBM PC, and was released on June 6, 1984. At the time, Pajitnov was working at the Dorodnicyn Computing Center, which was a part of a Soviet government funded research center in Moscow, called the Soviet Academy of Sciences. Because Pajitnov was working for the government and was using their equipment when he created Tetris, they retained the rights to the game in the beginning with no royalties being paid to Pajitnov. The game was a huge hit within the USSR almost immediately, being given away freely by the Soviet Union throughout Eastern Europe and the USSR. Within a year of its launch, it spread to Western Europe and by 1987 spread to North America. At this time, the Soviet Union set up a company called Elorg (Elektronorgtechnica) to manage the licensing of Tetris throughout the world, which they tended to fail at spectacularly, in terms of actually collecting any royalties. Many companies simply licensed the game out themselves despite never having been granted rights to it in the first place. The most notable instance of this was the British Andromeda company. While they were negotiating to get the rights to sell the licensing rights to the game, they went ahead and started selling it. After failing to acquire the rights to do what they had already done, they simply kept selling the rights to the game anyway. In any event, by 1988, the game became a huge hit in the United States on the computer and NES, combining for over two million copies sold. 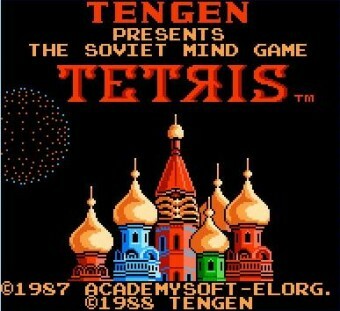 After the Soviet Union was dissolved in 1991, Pajitnov moved to the United States, but the Russian government still maintained licensing rights to Tetris. Finally, in 1996, the rights to the game were passed to Pajitnov, who was at the time working at Microsoft (from 1996 to 2005). Pajitnov then set up The Tetris Company with Henk Rogers as his business partner, finally receiving royalties for the game he’d created 12 years before. The name “tetris” derives from the Greek prefix “tetra-” (because the game pieces are all tetrominoes) and the latter “-is” is from “tennis”, which is Pajitnov’s favorite sport. Tetrominoes are four element polyominoes. Polyominoes have been used in puzzle games for at least 90 years (and most likely much further back than that), at the time Pajitnov developed Tetris. Interestingly, despite the fact that no “look and feel” copyright suit has ever held up in court, The Tetris Company has successfully stopped major companies throughout the world from distributing tetromino style games without first acquiring a license from The Tetris Company. Even Google themselves, in May of 2010, backed down from The Tetris Company when they forced Google to remove all tetromino games available on the Android not licensed through TTC, even though several of those games contained no reference to Tetris. The original Tetris game was developed on an Electronica 60 computer, but was later ported to an IBM computer, which allowed for its rapid spread throughout the Soviet Union and eventually the world. While working at Microsoft, Pajitnov developed several games including: Microsoft’s Entertainment Pack: The Puzzle Collection; MSN Mind Aerobics; and Microsoft’s Pandora’s box, among many others. He also helped design the puzzles in Yoshi’s Cookie, on the Super Nintendo, and developed Hexic HD on the Xbox 360. After leaving Microsoft in 2005, he subsequently began working with WildSnake Software to develop a line of puzzle games. Playing Tetris has been shown to lead to increase brain efficiency for certain tasks, such as critical thinking, reasoning, and even language processing. It also has been shown to increase cerebral cortex thickness. As little as a half hour per day of playing Tetris for three months or more has been shown to provide marked improvements in people in these areas. Pajitnov also created a sequel to Tetris called “Welltris”, which is very similar in principle to Tetris, except that it’s in 3D space and the game player looks at the board from above. When a line block clears four lines at once, being the only piece that can do so, it is known as a tetris.